Bolivia's former top policeman who had previously been in charge of its counter-narcotics force is being held on suspicion of illicit enrichment and links to the drugs trade. Gen Oscar Nina led Bolivia's national police force from 2010 until 2011. His wife, daughter and son were also arrested and have been charged with illicit enrichment. Bolivia is the world's third largest producer of cocaine after Peru and Colombia. His arrest comes less than four years after a US court sentenced another former Bolivian drug czar, Rene Sanabria, to 15 years in jail for drug trafficking. Gen Nina was sacked as police chief just over two weeks after Sanabria was arrested, although it is not clear whether the two events were linked. 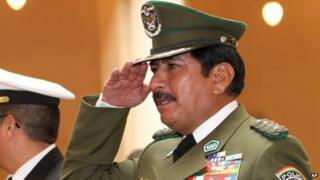 President Evo Morales said at the time that Bolivia had to eradicate the "cancer of corruption" from the police force. Interior Minister Hugo Moldiz said that there had been "serious suspicions for years" that Gen Nina had links with drug trafficking. He said his arrest "sent out a signal that there won't be any complicity of any kind". Gen Nina's son was also detained, while his wife and daughter were placed under house arrest. All four have been charged with illicit enrichment. Prosecutor Ana Luisa Heredia said there was also evidence of links to drug trafficking. Gen Nina has in the past denied any wrongdoing. Before taking up the post of police chief Gen Nina had been in charge of the counter-narcotics force from January 2009. He was asked to reorganise the force after President Morales expelled the US Drug Enforcement Administration (DEA) from Bolivia. The DEA had close links with Bolivia's counter-narcotics force and had provided training as well as material and strategic support. But President Morales accused it of being "an instrument the US uses to blackmail those countries who don't comply with imperialism and capitalism", and banned its agents from the country. The most recent United Nations figures suggest coca cultivation in Bolivia has dropped to its lowest level since 2002. The UN also said Bolivia was on course to reduce the coca-growing area to 20,000 hectares.